George came from a family with a long history in the film business. His grandfather worked in the early days of film in New York with his start in the early 1920's leading to being part of the original group of men who formed Local 52, created in 1924. His grandfather originally started as an electrician but moved to sound later in his career. He often talked about the advent of the "talkies", the original films made with sound. He worked with film legends such as the Marx Brothers (Coconuts), D. W. Griffith, and Gloria Swanson. 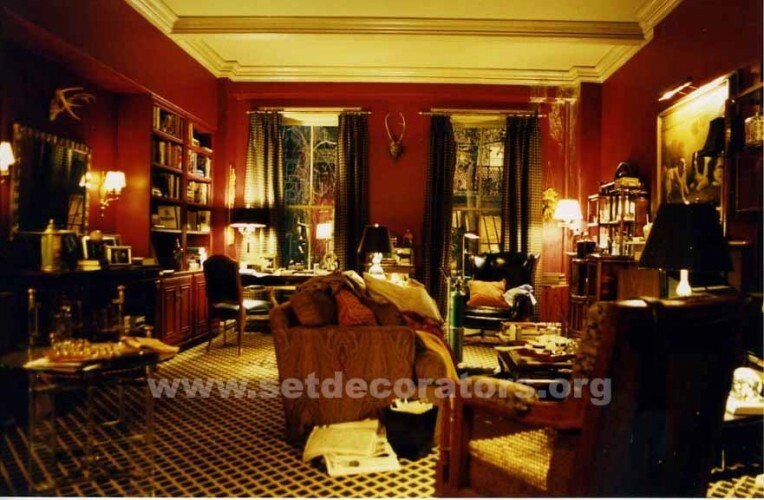 Then George’s father started his film career in the mid 1950's working as a set decorator. He worked on such films as The Exorcist, Three Days of the Condor and Hair. He last worked on Home Alone 2 before leaving to work in our local (NY), eventually becoming president of Local 52. He retired in 2003. George has two brothers also in the film business, working as leadmen. Jerry, has worked with George on many films and recently completed 5 years on Law & Order SVU before coming back to work with to work with George on the films Enchanted and I Am Legend. His other brother, Chris, was the leadman for George on Inside Man and the NY portion of Munich. The family tradition continues with George’s son Dan working as a shopper on his last few shows and his daughter, Lauren, currently working as his set decorating coordinator on Warner Brothers’ I Am Legend. 1. 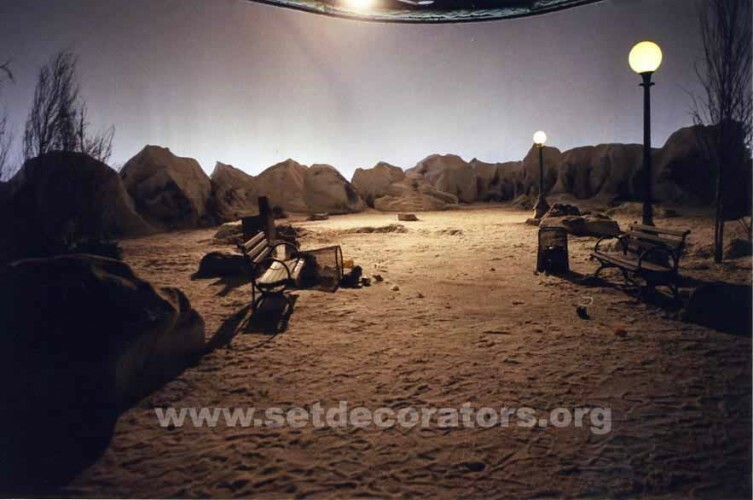 What type of education did you receive before going in to the field of Set Decoration? Pursuing a strong interest in art throughout high school, I entered Montclair State College in NJ in 1973 as a fine arts major. I was a printmaking major, eventually graduating with a BA in Fine Arts. 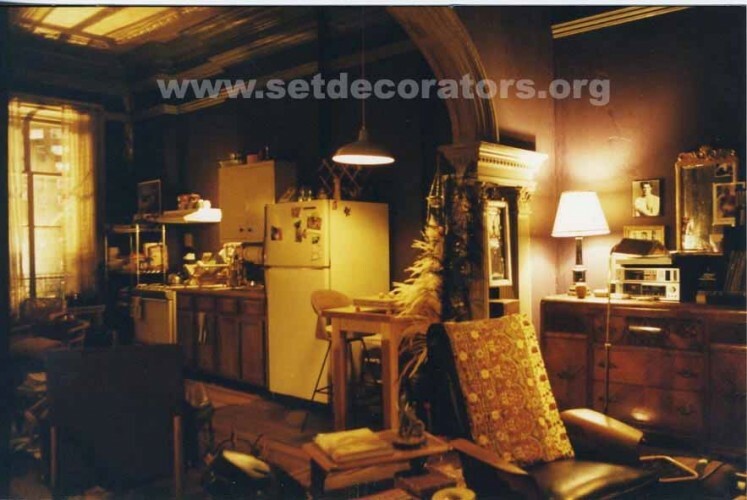 Thinking I might want to enter into the advertising field with an eye toward the art department, I interviewed at some top NY agencies while working as a set dresser on films that my father was a set decorator on. Work on those early films such as All that Jazz and Hair led to an opportunity to work as a set decorator on Ragtime. 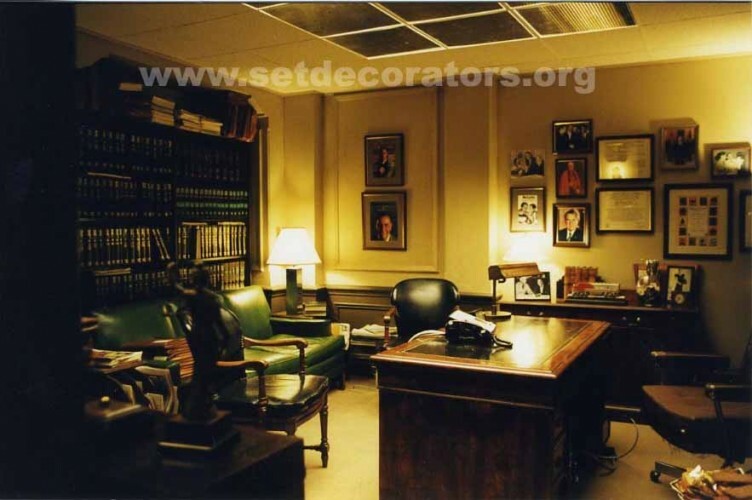 At the time my father who was set decorator was offered the film but could not leave the film he was on (Prince of the City) and needed someone to start pre-production. Patizia von Brandenstein, Academy Award nominated Production Designer, agreed to have me start the film and eventually we worked out a schedule that I covered all the NYC locations and my father who came on months later did the out of town locations. 2. Which sources would you say are the best tools for research and learning? The Internet is great source for obtaining information in the shortest period of time. I still prefer books, though, which I find are the most helpful . With todays resources you can usually find most out of print books from a variety of sources. I also love to look at old photos in flea markets, antique shops etc. I often find that you can study these everyday snapshots and school yearbooks and they can sometimes offer more than what may be featured in a coffee table book. 3. Name three of your favorite projects and why. League of Their Own: a great project overall. Good script, period setting and the ultimate hunt for great old set dressing whether it be old turnstiles for a stadium setting, concession stand dressing or old farm furniture. We had a great art department and I also was able to bring some of my crew from New York. The ultimate location movie. An absolute delight, Bill Groom's (Production Designer) great period designs, Penny's (Penny Marshall, the Director) ultimate set compliment… “Is that table for sale, George?”, to Karaoke nights in Evansville. Good memories and a rewarding work experience. Stay: a delightful experience that starts at the top with a wonderful director, Marc Forster, fine production team, great crew and a talented Production Designer, Kevin Thompson. The story is mostly set in time that is removed from reality so it affords the design concept another dimension. You can do things with decorating that normally you might not do. This film keyed off elements of a car accident that took place on the Brooklyn Bridge so there were conscious efforts made to emphasize the architecture of the bridge throughout the overall design of the movie. This idea carried over into the set dressing with the idea to incorporate steel, glass and reflective qualities that also reinforce the car accident in addition to the bridge elements. Angels In America: A year long project with a renowned Director, Mike Nichols, whose creative vision reinforce the idea that this project was special. Working with Production Designer, Stuart Wurtzel, and a great team in the art department, everyone made this project an unforgettable experience. The writing, the acting and overall aura of this project contributed to inspiring work. My talented crew and fine assistants made this job a memorable one. 4. 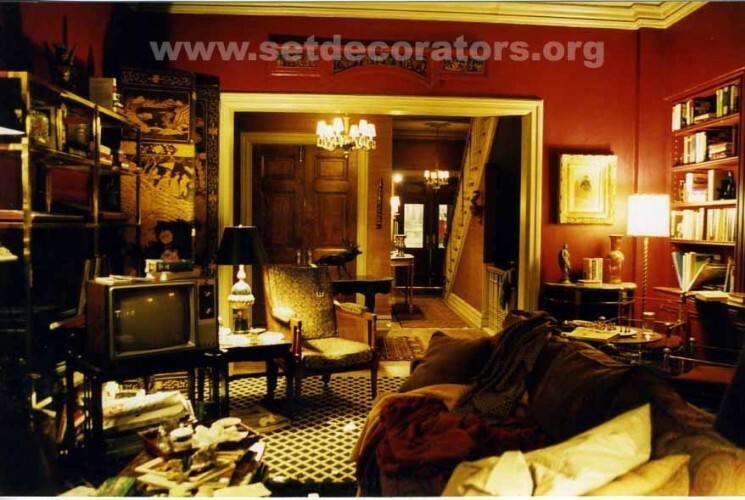 What has been your biggest challenge as a set decorator? 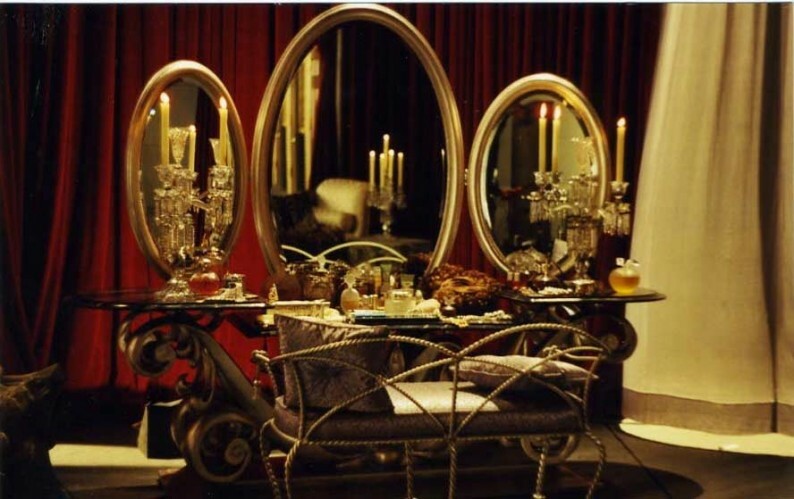 I think the challenge of every Set Decorator is to deliver the vision of the designer but with enough of your own creative input to make it creatively satisfying to call it your own. At the same time to satisfy the director in his quest to tell the story and the producers need to bring it in for a certain number. It's all about balancing all of the elements successfully, hoping that in the end you have satisfied all of these people including yourself. 5. Please list any SDSA business members and others with whom you do business and comment on them. I do business with many of the NY area vendors, who also are members of the SDSA . They all have their areas of expertise; I like to think of them all as part of a puzzle where the pieces all come together to make the whole picture one in the end. 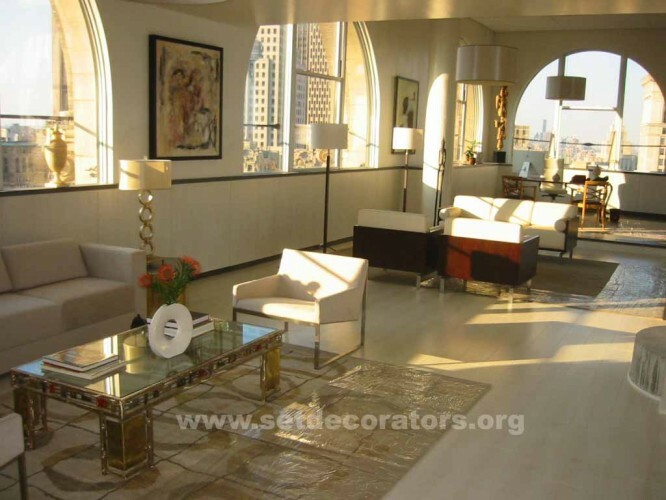 They are always helpful and accommodating whether it is a low budget project or big budget film. Props For Today: Diane and Dominque. Always a pleasure. Best contemporary selection; stays current; biggest selection. Always something new. Something for every room. Endless selection. Prop Company Kaplan & Co.: Maxine & Howard & staff. Max's great eye makes this the "boutique" prop house of NY. Every piece hand chosen. 6. What are the current contents of your car? Work car: 2 tape measures, NY tax exempt forms, rolls of plans, cell phone charger the NY newspapers, 2 jackets, a baseball cap and a Starbucks grande skim latte. It's the other 4 cars that you really don't want to know. 7. 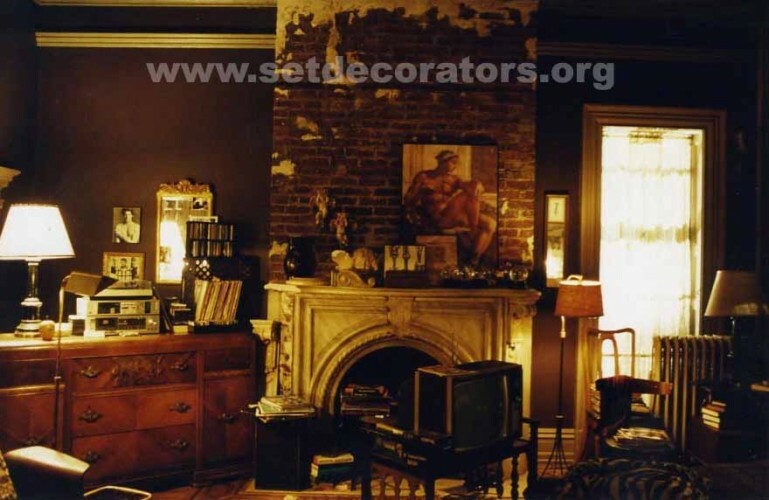 What advice do you have for those interested in the field of set decorating (including those new and already in the profession)? 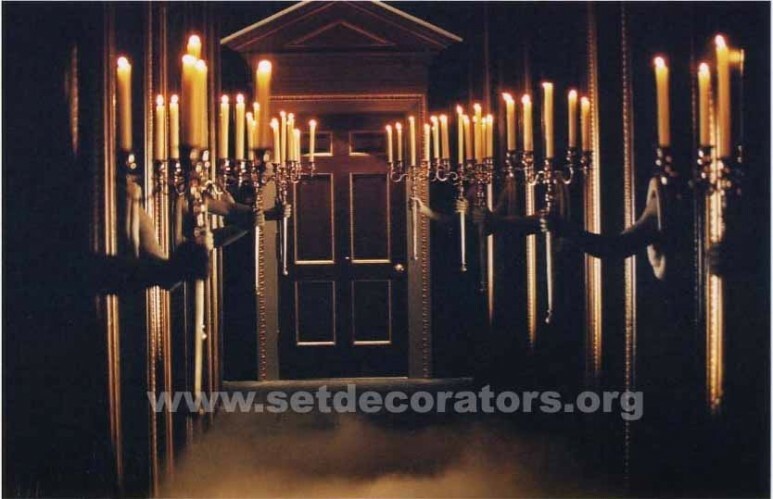 For those who are interested in the field of set decorating...for those considering the profession I would say that it can be rewarding, fun and challenging BUT like everything else it is a business. It is not one continuous shopping spree. 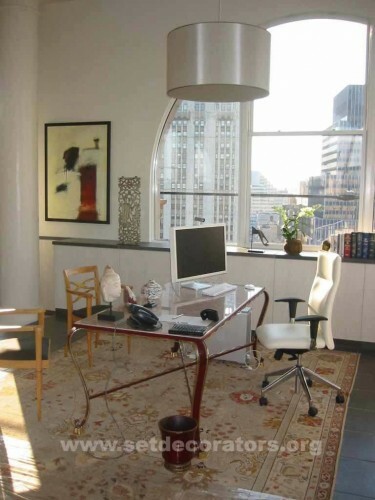 It involves good planning, financial responsibility, the personality to work with many and of course a creative sense. Last, but not least the need to remember that you cannot do it alone. A good crew is a must. Without them you can have all the good intentions in the world but in the end you'll have a tough time pulling off the job. The crew is your life blood. Respect what they do and their contribution to end result. 8. Which three tools of your profession can you not be without? If you are going to pull off any job and not have to be concerned with all the other problems that arise on a show, this is a must. A good leadman will organize, run a good crew, deal with the politics and get the job done. Good assistants are a must. 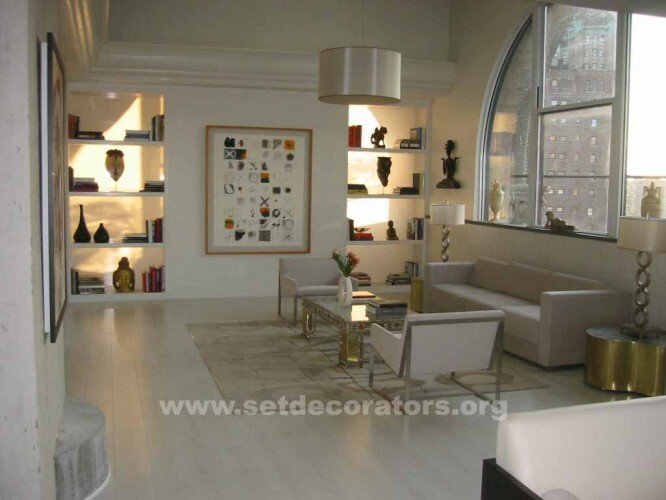 They can can free up your time to deal with the other matters in a set dressing world that has grown more complex in recent years. The demand for schedules, budgets, meetings, etc. sometimes leaves less time to do actual decorating. Good assisants will help you balance all the needs of the job so that you can find the time to deliver the creative job you were hired to do while still keeping other production needs satisfied. 9. 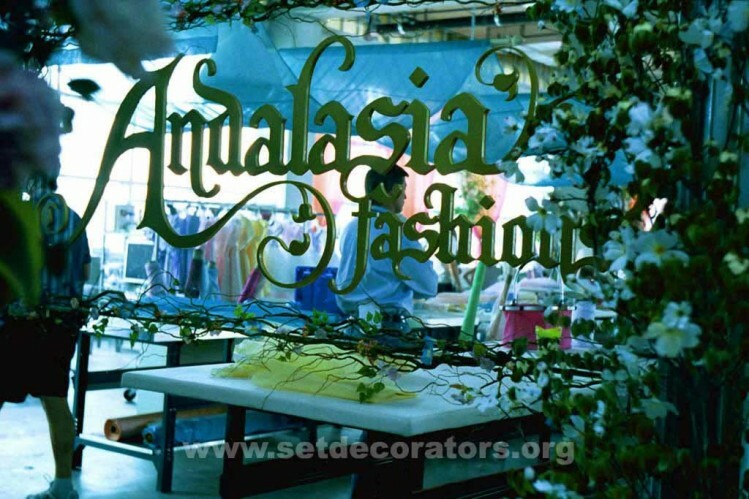 Name your biggest set decorating disaster? Not many over the years but the one that comes to mind happened while doing Working Girl. 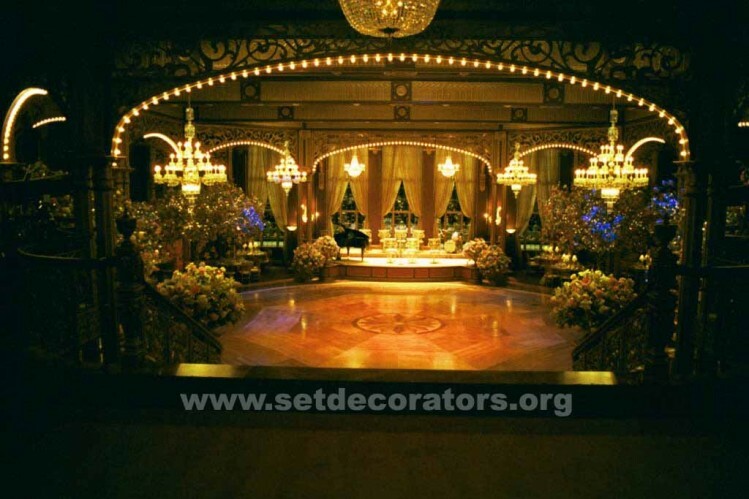 We were prepping the wedding scene, decorating a beautiful ballroom setting. The room needed drapery and I measured accordingly. I received a phone call from the set dressers telling me of the potential problem...the drapes only covered three quarters of the floor to ceiling massive windows. My drapery place had left off the first number of the measurement length (in inches), thereby shortening the drapery about 8 feet. I now had expensive drapery covering half of the windows. I went to the location and decided to have tiebacks made and an extra leg of drapery for each panel that was the length from where the drapery ended to the floor. I attached the tiebacks where the shortened panels ended and covered the seam with the tiebacks. You never knew that the drapes were two separate pieces. Problem solved but not without a little aggravation. 10. What advice would you give other members of the SDSA on how to get the most benefit from their membership? Let the SDSA membership help you network with other members and vendors to assist in making the job easier. Whether it be for a new source or a reason to have a get together it helps people in a very specialized business to seek out others who have a creative, challenging profession in common.